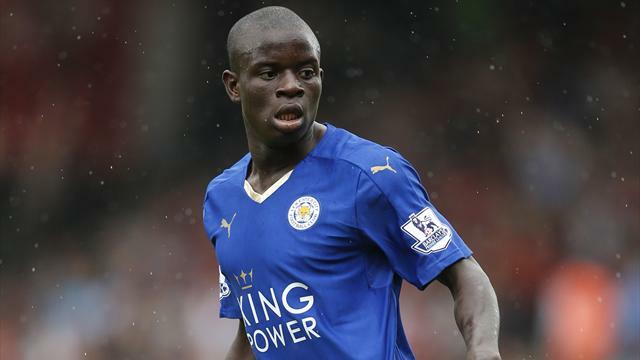 N'Golo Kante has sprinkled gold dust over Leicester's bid for the Premier League title. It is vital he misses no more than a couple of matches if they are to finish off the seemingly impossible job they started, writes Desmond Kane. His name hints at the role he performs for football’s unlikely lads. N’Golo Kante sounds a bit like No Goal, and when he performs at the peak of his powers, there is no sharper, more energised midfielder in the Premier League in helping to prevent them. Leicester apparently unearthed only £5.6m to land Kante from the French Ligue 1 side Caen last summer. An astonishingly paltry fee for a lithe and rampant figure who was remarkably without a club only three years ago. Who says football clubs know anything about football? At the age of 24 and only 5ft 5in, this young chap is smallish in size, but giant in stature. Kante’s contract with Leicester is a lucrative as Gary Lineker’s is with Walkers Crisps when you consider the company Kante has been keeping in the world’s richest league. He could be sold now for £30m and nobody would bat an eyelid. Kante of Real Madrid? Kante of Barcelona? You can envisage it now. Like his glorious companions at the King Power Stadium, Kante has seemed oblivious to his ongoing role in the making of one of what could yet be the greatest story ever told in the modern game. Like his companions, he revels in the role of being the man and playing the man rather overthinking things amid Leicester’s miraculous rise from Premier League plankton a year ago to outright 2/1 favourites for the trophy. With 27 games played this season, Kante is number one in his weight division. He is also number 111, the total figure of tackles and interceptions he has made is greater than any player has managed in the Premier League this season. He has won 82 tackles, more than any other player among England’s elite. He translates desire into fulfilment. His passing accuracy compares favourably across Europe’s leading five leagues which is impressive when you consider how content Leicester are to concede possession before countering at breathtaking speed. Yet Leicester will face West Bromwich on Tuesday night entering uncharted waters. They have yet to confront a league match without Kante, whose hamstring strain forces him to rest for at least two matches. He has started every league match since the 3-2 win over Aston Villa in early September. Claudio Ranieri, who no longer tinkers when he knows what is right, was putting a brave face on the news that his side will be without such a potent force for their next few fixtures in their unheralded pursuit of immortality. He could have been forgiven for wondering wonder why a happy leap day forced him to confront such regressive news. Andy King is handy, but he is no Kante. With a week off due to the FA Cup quarter-final after Saturday's potentially fraught trip to Watford, at least Leicester and Kante will be afforded some respite. His legs pumping like pistons, Kante’s limbs seems to move faster than the speed of sound. When Leicester were reduced to 10 men in the galling 2-1 defeat at Arsenal a fortnight ago, he seemed to do the work of two men, leaving the Emirates Stadium clutching the man of the match award as a consolation prize for a shift that deserved so much better. As one Leicester fan put it on social media; "most people run of breath, Kante runs out of land". In a side full of unlikely success stories ranging from Wes Morgan and Robert Huth in central defence performing with more security than the Alliance and Leicester to the goals and explosive cunning of Jamie Vardy and Riyad Mahrez in the forward areas, it is debatable if there is a sprightlier fox than Kante. Didier Deschamps, the France coach, was once infamously derided as a "water carrier" by fellow Frenchman Eric Cantona back in his playing days, an insult that suggested he was only there to retrieve the ball and provide more skilful figures with it. Kante operates in a similar role to Deschamps, but is so much more than a defensive midfielder in his ability to spot danger, break up attacks, cover ground and keep the ball moving. He is the pivotal figure in the rope-a-dope tactics Ranieri has encouraged his squad to embrace. He merits a shot at earning himself a place in France’s squad for Euro 2016 this season because he is easily of that calibre. While Vardy (19 goals) and Mahrez (14 goals) are coveted figures with goals and assists, they would be nowhere without their power behind the throne. Anybody who thinks the whole is greater than the sum of its parts in describing Leicester have not been playing attention. Not when they possess a midfielder who could fit snugly into such a role with any of European football leading sides. "Last season in the first five leagues of Europe, he was No 1 to recover the ball. He is showing his quality now here," said Ranieri. "He is fantastic because he reads the situation very well. If you look at him, his movement, he attracts the ball. He is very smart and very fast in his movement." Roy Keane, Bryan Robson, Patrick Vieira, Yaya Toure, Claude Makelele... every English champion has possessed such a figure who stands out in the furnace of the storm that rages in the midfield boiler room. Will Kante add his name to the list in May? Or will it be dismay over being left hamstrung by the curse of untimely injury? His two-match absence is not quite Kante’s inferno, but Leicester could quickly crash and burn if such a genuine talent goes missing just when he is needed most. There are not too many figures who can touch him in England or around Europe.